With one week of school in the books, I am finally getting used to living in a hotel. First, I’ve got my printer working (it was a tragic first few days without a printer). Second, and most importantly, I have just discovered how to make scrambled eggs in the microwave and they were EGGcellent!! My favorite post-morning-workout breakfast is an omelet, so after my run this morning I decided I would give microwave eggs a shot in the tiny hotel microwave. These eggs were so fluffy and delicious that they are probably my new favorite microwave food. They were also much easier and less messy than making eggs on the stove, so I will be making these even once I move into my apartment. Crack as many eggs as you want (or as many that fit) into a microwave safe coffee mug and mix with a fork until the yolks are mixed in. I like to use egg whites because you still get lots of protein, without the fat, cholesterol, and high calories in the yolk. Optional: Add some chopped veggies to make it more like a scrambled omelet. I used zucchini and broccoli this morning. Put the mug into the microwave on high for 1 minute then stir. Place it back into the microwave for 1 minute and stir again. If the eggs are no longer runny, they are ready for you to enjoy. If they are still runny, continue to microwave and stir at 30-second intervals until they are fully cooked. 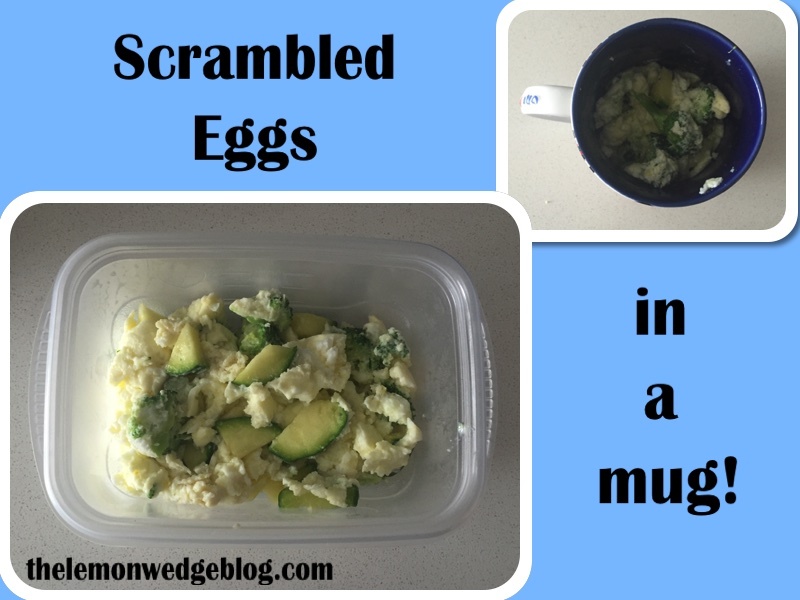 Enjoy your eggs straight out of the mug or put them onto a plate. You can also make these in a disposable coffee cup for eggs on the go. Just bring you cup of eggs in the car with you, and they fit nicely in the cup holder. Eggs are a good breakfast choice (especially with the vegetables) because they are high in protein to keep you satisfied throughout the morning.